WASHINGTON, DC — Hillary Clinton received a classified intelligence report stating that the Obama administration was actively supporting Al Qaeda in Iraq, the terrorist group that became the Islamic State. The memo made clear that Al Qaeda in Iraq was speaking through Muhammad Al Adnani, who is now the senior spokesman for the Islamic State, also known as ISIS. Western and Gulf states were supporting the terrorist group to try to overthrow Syrian dictator Bashar al Assad, who was being propped up by the Russians, Iranians, and Chinese. 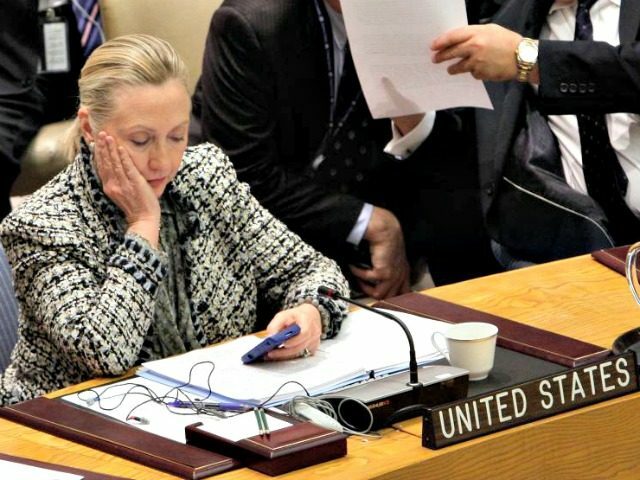 In August 2012, a “SECRET” classified memo was sent to various top Obama administration officials and agencies, including to the State Department and to Clinton’s office personally. “The document is an IAR, an intelligence information report,” said Christopher J. Farrell, who serves on the board of directors of Judicial Watch, which obtained the document. “It is produced by somebody within the Defense intelligence agency (DIA). It is reporting from the field by an intelligence agent” who could be a U.S. government agent, a defense attaché, or a source. “It’s a report from the field back to headquarters with some intelligence that somebody is willing to bet their career on,” Farrell said. A. INTERNALLY, EVENTS ARE TAKING A CLEAR SECTARIAN DIRECTION. B. THE SALAFIST, THE MUSLIM BROTHERHOOD, AND AQI ARE THE MAJOR FORCES DRIVING THE INSURGENCY IN SYRIA. C. THE WEST, GULF COUNTRIES, AND TURKEY SUPPORT THE OPPOSITION; WHILE RUSSIA, CHINA, AND IRAN SUPPORT THE REGIME. The intelligence report contains an extensive backgrounder on AQI and its methods and capabilities, noting that AQI was speaking through the spokesman of the Islamic State of Iraq Muhammad Al Adnani. Al Adnani is now the chief spokesman for the current version of the Islamic State, also known as ISIS. A. AQI IS FAMILIAR WITH SYRIA. AQI TRAINED IN SYRIA AND THEN INFILTRATED INTO IRAQ. B. AQI SUPPORTED THE SYRIAN OPPOSITION FROM THE BEGINNING, BOTH IDEOLOGICALLY AND THROUGH THE MEDIA. AQI DECLARED ITS OPPOSITION OF ASSAD’S GOVERNMENT BECAUSE IT CONSIDERED IT A SECTARIAN REGIME TARGETING SUNNIS. C. AQI CONDUCTED A NUMBER OF OPERATIONS IN SEVERAL SYRIAN CITIES UNDER THE NAME OF JAISH AL NUSRA (VICTORIOUS ARMY), ONE OF ITS AFFILIATES. D. AQI, THROUGH THE SPOKESMAN OF THE ISLAMIC STATE OF IRAQ (ISI) ABU MUHAMMAD AL ADNANI, DECLARED THE SYRIAN REGIME AS THE SPEARHEAD OF WHAT HE IS NAMING JIBHA AL RUWAFDH (FOREFRONT OF THE SHIITES) BECAUSE OF ITS (THE SYRIAN REGIME) DECLARATION OF WAR ON THE SUNNIS. ADDITIONALLY, HE IS CALLING ON THE SUNNIS IN IRAQ, ESPECIALLY THE TRIBES IN THE BORDER REGIONS (BETWEEN IRAQ AND SYRIA), TO WAGE WAR AGAINST THE SYRIAN REGIME, REGARDING SYRIA AS AN INFIDEL REGIME FOR ITS SUPPORT TO THE INFIDEL PARTY HEZBOLLAH, AND OTHER REGIMES HE CONSIDERS DISSENTERS LIKE IRAN AND IRAQ. E. AQI CONSIDERS THE SUNNI ISSUE IN IRAQ TO BE FATEFULLY CONNECTED TO THE SUNNI ARABS AND MUSLIMS. THIS CREATES THE IDEAL ATMOSPHERE FOR AQI TO RETURN TO ITS OLD POCKETS IN MOSUL AND RAMADI, AND WILL PROVIDE A RENEWED MOMENTUM UNDER THE PRESUMPTION OF UNIFYING THE JIHAD AMONG SUNNI IRAQ AND SYRIA, AND THE REST OF THE SUNNIS IN THE ARAB WORLD AGAINST WHAT IT CONSIDERS ONE ENEMY, THE DISSENTERS. ISI COULD ALSO DECLARE AN ISLAMIC STATE THROUGH ITS UNION WITH OTHER TERRORIST ORGANIZATIONS IN IRAQ AND SYRIA, WHICH WILL CREATE GRAVE DANGER IN REGARDS TO UNIFYING IRAQ AND THE PROTECTION OF ITS TERRITORY. “AQI HAD MAJOR POCKETS AND BASES ON BOTH SIDES OF THE BORDER TO FACILITATE THE FLOW OF MATERIEL AND RECRUITS,” the report states. “THERE WAS A REGRESSION OF AQI IN THE WESTERN PROVINCES OF IRAQ DURING THE YEARS OF 2009 AND 2010; HOWEVER, AFTER THE RISE OF THE INSURGENCY IN SYRIA, THE RELIGIOUS AND TRIBAL POWERS IN THE REGIONS BEGAN TO SYMPATHIZE WITH THE SECTARIAN UPRISING. THIS (SYMPATHY) APPEARED IN FRIDAY PRAYER SERMONS, WHICH CALLED FOR VOLUNTEERS TO SUPPORT THE SUNNI’S IN SYRIA,” the report continues. Al Adnani was named by the State Department as a “Specially Designated Global Terrorist” in 2014. The Clinton campaign did not immediately return a request for comment on this report.